How do we talk to our students about crises? What advice should we offer to parents? What should teachers do to help their students? What kinds of crisis response plans should schools have in place? 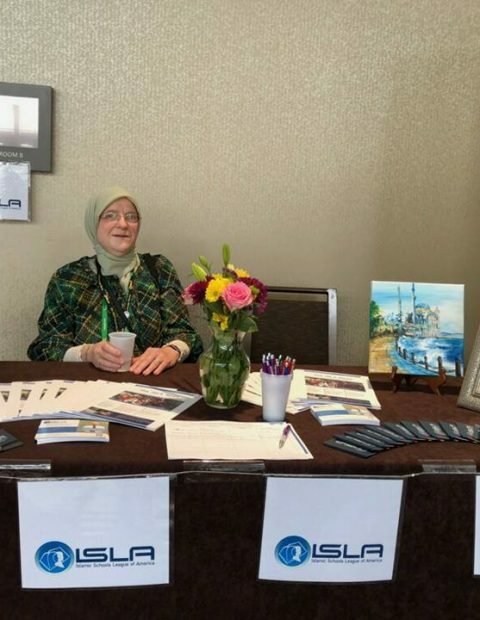 Members of the Islamic Educators’ Communication Network (IECN), an email group operated by the ISLA for Islamic school educators in the US, have come forward to share many resources that might help address the concerns listed above. Here, we have compiled some of those resources so that they are easily accessible for educators and parents seeking answers to these very difficult questions. We are grateful to those who have so generously shared their resources, which undoubtedly were crafted with much thought, time and collaborative effort. 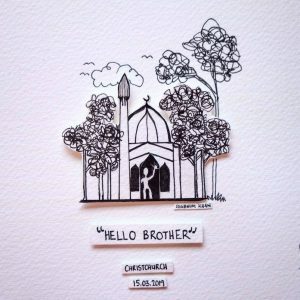 The handout effectively integrates elements from within the Islamic faith to provide comprehensive ways of talking about tragedies, even when all of the crisis details are not yet known. Click to see full PDF. 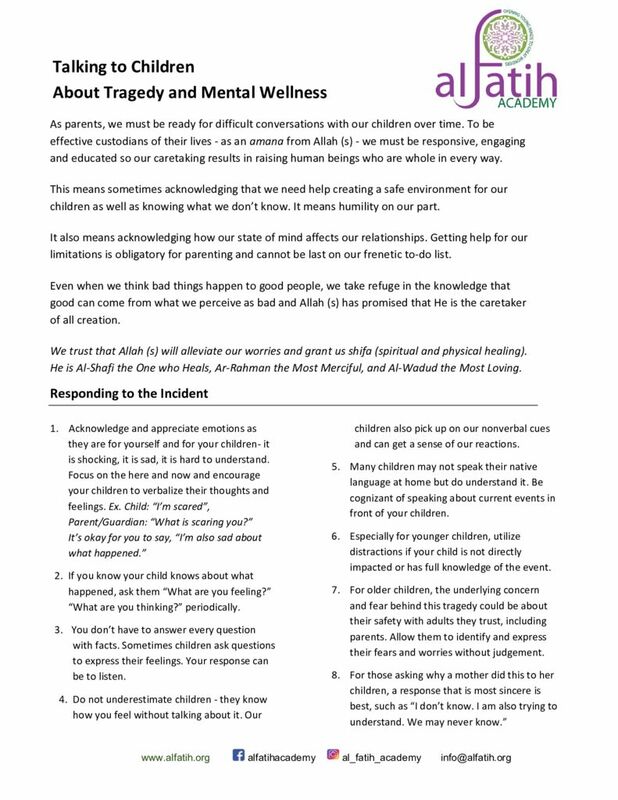 Al-Fatih Academy, in the wake of the attacks on these mosques, shared the following resource with their parents, AFA How to talk about current events (click to open). 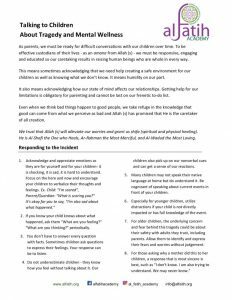 This document includes an overview of a range of feelings children may be having in response to the current event, family halaqa ideas, and links to additional resources. This document was produced after the Tree of Life Synagogue shootings in Pittsburgh in 2018. There are many points that relate to Muslims, particularly in the wake of an Islamophobic attack. Teachers can provide students with a safe space to discuss how they are feeling and ask questions, but do not overdo it either. Schools and teachers should maintain traditional routines since the predictability helps students’ sense of security. Teachers should listen more, speak less. Listen to students’ peer-to-peer conversations about the current event and judge when it is best (if at all) to engage them on the topic. If a classroom discussion moves towards the question of “what can we do?,” allow students to come up with age-appropriate suggestions. For example, elementary school students may want to make cards for victims’ families. Or, middle or high school students may be interested in holding a vigil or hosting an online fundraiser that benefits the bereaved. Allow students to lead those efforts, but appoint a teacher or administrator to oversee it and assist with logistics and successful implementation of the initiative. The efforts should not necessarily take the place of academic instruction, but may be voluntary and take place during lunch or after school hours. Teachers should not try to answer questions that they do not have answers to. It is okay to admit that you do not have all of the answers. As suggested in the article referenced above, safety drills are important because they help people prepare for crises and strengthen our sense of security. Although the drills may initially be met with some anxiety, it is important for school leaders to set the tone and let students and parents know that while there is no immediate threat, the drills are another way that the school is working to ensure the safety of everyone on campus. Crisis response plans are a larger component to ensuring the safety of students and staff. They are comprehensive plans that address what a school or institution should do in the impending or actual case of a crisis. They allow schools to be prepared for these instances, thereby mitigating harmful outcomes. Crisis response plans address a broad range of crises, including natural disasters, active shooters, bomb threats, fires and even water main breaks or electrical outages. Click here for our post on Crisis Planning for Schools- Resources to help your school craft a solid Crisis Response Plan. We hope to continue updating this post with more resources as we find them. 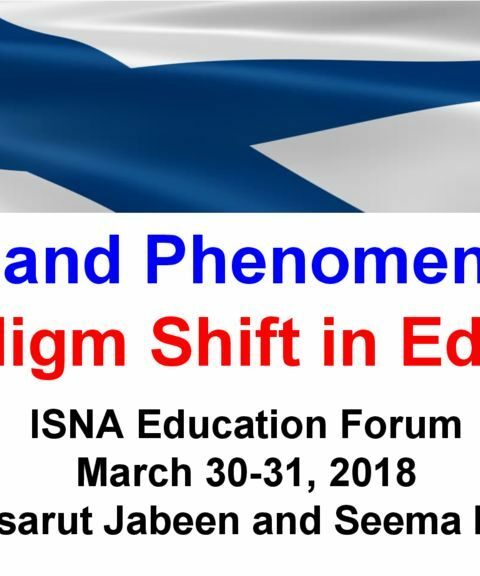 We are trying to compile those that are most immediately relevant to Islamic schools and Islamic school educators. If you have something that you think will be of use, please email us at info@theisla.org.